THE RAINFED rice industry is gaining traction on the Northern Rivers of New South Wales at a time when NSW’s traditional rice-growing area, the Riverina, is reducing area due to competition from other crops and limited water for irrigation. Northern Rivers’ production last year hit 3000 tonnes, and the region is producing conventional and bio-dynamic rice, all of it milled at Slater Farms near Casino, which added rice to its summer and winter-cropping rotation after 2008. “That was the year we had our biggest flood in 50 years, and southern NSW had its smallest crop because of limited water,” Slater Farms principal Brett Slater said. Mr Slater and wife Karen grew their first rice crop in 2009, and have since transitioned from organic to bio-dynamic farming. Rice now makes up one-third of Slater Farms’ summer-cropping area of 344 hectares, with soybeans holding the balance. The Northern Rivers has an annual average rainfall of around 1000 millimetres. Most of it falls between January and March. The rainfall pattern makes the region ideal for growing rainfed rice, but its distance from existing rice mills in the Riverina in southern NSW, and the Burdekin in North Queensland, posed an immediate problem for Slater Farms. The mill arrived in four 40-foot shipping containers, and took six months to assemble. It grades and dehulls the grain to produce brown rice. Mr Slater said the company was looking at adding a whitening process to its capabilities so it could also offer white rice to the market. “Being a farmer, I understanding machinery and cropping, but the marketing world was a challenge for us. Slater Farms is contract milling additional rice tonnage grown in the region for Natural Rice Co, which is now being supplied by close to 50 Northern Rivers growers, including cane farmers who are trialling a supplementary crop. Natural Rice Co managing director and food-industry veteran, Nelson Green, said the company was expecting to market rice from a record conventionally farmed area of at least 800ha next year. “We’ve been going for three years, and now we’re focusing on building infrastructure in the form of storage,” Mr Green said. Natural Rice Co is acquiring a site at Kyogle with potential to store up to 10,000t of rice, and with drying and aeration capacity to reduce rice moisture levels to around 14 per cent, instead of 22pc, which is common for rice at the time of harvest. Mr Slater said Slater Farms’ rice has yielded up to 7.5 tonnes per hectare, and as little as 2.5t/ha. “It suffers in the dry years, but does better in the wet years than soybeans, which we can lose if they get waterlogged. Slater Farms grows wheat, triticale and green-manure legume crops over winter. Mr Slater said rice was a good fit with soybeans as a summer crop in a three or four-year rotation. “We started planting rice late October or November, but found the pressure from grass weeds was high. Slater Farms harvests its rice in May. Under legislation which controls the rice industry in NSW, both Slater Farms and Natural Rice Co are authorised to buy rice for domestic sale. “We can contract growers on a per-area basis, we can supply seed, give them agronomic support, and buy the rice from them, and we commit to a price, but we cannot export,” Mr Green said. He said current legislation tied to the Rice Marketing Board and SunRice precludes Slater Farms and Natural Rice Co from holding an export licence. Mr Green and Mr Slater both said they saw potential for growth in rice production in the Northern Rivers, and Mr Green said export markets would be welcomed. 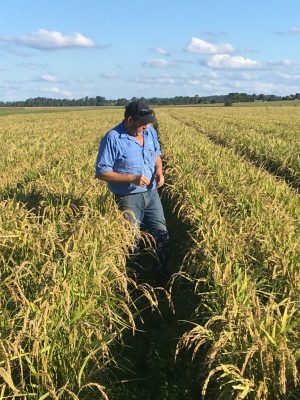 “Growers in the Northern Rivers aren’t going to make any money out of rice if they send it to SunRice in the Riverina, so we have to find domestic markets,” Mr Green said. According to SunRice, southern NSW in 2017 harvested 801,714t of rice at an average yield of 9.9t/ha. SunRice has handled crops as large as 1.2 million tonnes, with around 80pc exported to more than 60 countries in years of large production. Competition from cotton saw the 2018 crop come in at close to 600,000t, and limited irrigation supplies could mean the 2019 crop is a fraction of that, which would leave Australia’s domestic rice requirement of 300,000t profoundly short.